Millions of us are looking toward the future of our country and the prospects for our children and grandchildren in an America that is headed the wrong direction. With that in mind, please stop and take a “birds-eye” view of how money is provided to pay for Federal Government expenditures. It could be said that HOW money is CURRENTLY provided has become fatally flawed. This fatal flaw has created the overspending and huge deficits in Federal spending. Please consider the CONSTITUTIONAL SUPPORT TAX as the only workable new method of providing for constitutionally authorized expenditures, and for REAL control of Federal spending in the future. An axiom of governance in America has been that each unit of government – Federal, state or local – should have its own power to tax. The U.S. Federal Government (hereafter referred to as “the Feds”) is the only unit of government in the USA that also has the power to coin money. Further, the Feds have a captive money-printing machine in the Federal Reserve Bank. No other unit of government has an institution like the Federal Reserve Bank. Question: Have we reached a point where this current SYSTEM of providing money for the Federal Government is leading us to national bankruptcy? If the answer to this national bankruptcy question is yes, is there a replacement system that will provide money to pay for Constitutionally authorized expenditures while putting “the clamps” on the irresponsible Federal spending we have lived with for decades? Please consider the CONSTITUTIONAL SUPPORT TAX (the CST) as the replacement system. Taxation, borrowing and printing money give Congress monopoly control of Federal Government finance. The danger of this monopoly control should become evident shortly. The Articles of Confederation did not permit the Feds, at the time, to levy taxes on individuals, businesses, or the States. To raise money for Federal needs, mainly fighting the Revolutionary War, each State was presented a “requisition for funds” by the Feds. The Revolutionary War ran from April 19, 1775 (starting with the Patriots taking up arms at Lexington and Concord) until the Treaty of Paris was signed on September 3, 1783. (Credit to Essential Histories, The American Revolution 1774-1783, ISBN 184176343-6.) The War was a very heavy drain on manpower and money for the 13 new States and the Feds. The States did the best they could to financially support the Feds, but the strain of the times prevented many of the States from providing all of the money the Feds wanted. 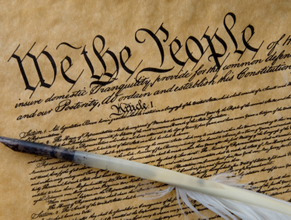 The Constitution was written in the summer of 1787. Because of the financial difficulties faced by the Feds during and after the Revolution, and the strong desire to see this first-time-in-human-history experiment in self governance succeed, We the People granted the power to tax and borrow to the Feds in the Constitution. For all practical purposes, the only taxes actually levied by the Feds during the 1800s were based on the Tariff Act of 1789 and the Distilled Spirits Act of 1791. There were other taxes that came and went, but essentially tariffs and distilled spirits were the only ongoing taxes. The Regressives, using what many people would call lies and deception, convinced enough Americans of the supposed sins of the “evil” rich, railroad “robber barons” and others to get the 16th Amendment Federal Income Tax pushed through in 1913. The arguments put forth by Alexander Hamilton in Federalist Papers 30 – 36, supporting the idea of the Feds having taxing power, could be considered sound in the context of the LIMITED CONSTITUTIONAL GOVERNMENT envisioned by the Founding Fathers. Unfortunately, due to the bit-by-bit, baby step-by-baby step actions of the Regressives for the past 100+ years to expand the Fed’s power in our lives, we no longer have the limited constitutional government the Founding Fathers intended. Ladies and gentlemen, the power of the Feds to continually replenish the pool of money available to spend by: (1) the mandatory requirement that Americans pay Federal taxes; (2) borrowing in the worldwide credit markets, and (3) the creation of money out of “thin air” by the Federal Reserve to buy Treasury securities has led to the trillion-dollar+ deficits we now have. With thousands of spending interests “chomping-at-the-bit” to get that money, the problem of overspending will never stop. That is, UNLESS AND UNTIL the CONSTITUTIONAL SUPPORT TAX (the CST) is put in place to control the now-uncontrolled flow of money into the Federal spending pool. Despite comments to the contrary, taxation and spending by the Feds are deeply intertwined matters. By putting the States between the taxpayers and the Feds, the CST is the only new approach to Federal Government finance that will bring control to that flow of money. The Feds should get the money needed to pay for constitutionally authorized expenditures through the States. Please read the full, detailed description of how this will be done on the continuation of this site. It is time to implement the Constitutional Support Tax to get back to what the Founding Fathers intended. Want to share this message with your friends and family? Download an easy-to-print copy of this introduction HERE. *Requires Adobe Acrobat or Reader, downloadable HERE.